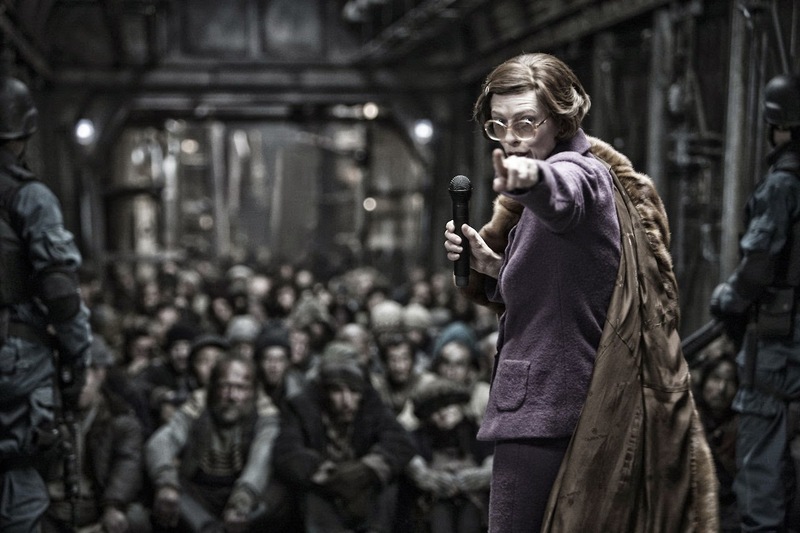 Hello, Tailor: Interview: "Snowpiercer" costume designer Catherine George. 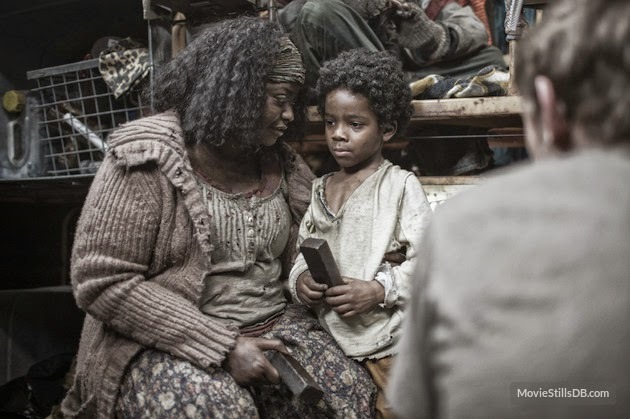 Interview: "Snowpiercer" costume designer Catherine George. 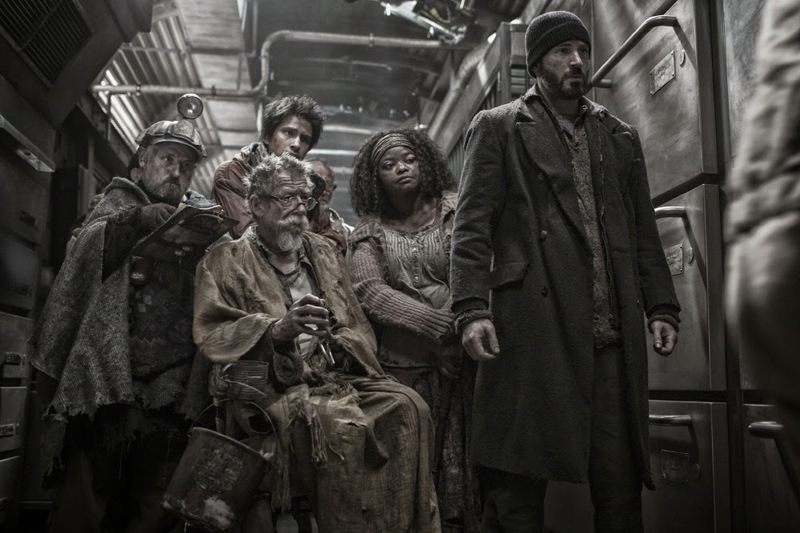 Following my review of Snowpiercer, I originally intended to write a post discussing the film's very striking costumes. But after looking back at some photos and clips, I was struck by how much more I wanted to learn about the process behind this film's visual design. Each section of the train had such a strong theme (filth and poverty in Tail Section; delusionally wholesome springtime pastels in the school car; opulence and luxury towards the front of the train), but nevertheless felt grounded in reality. Happily, costume designer Catherine George agreed to an interview about her work on the film. 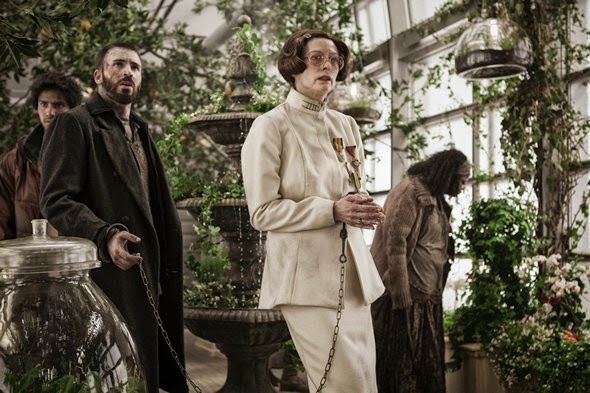 She discussed the inspiration behind Snowpiercer's most memorable costumes, and what it was like to work with director Bong Joon-Ho and a cast including Chris Evans and Tilda Swinton. 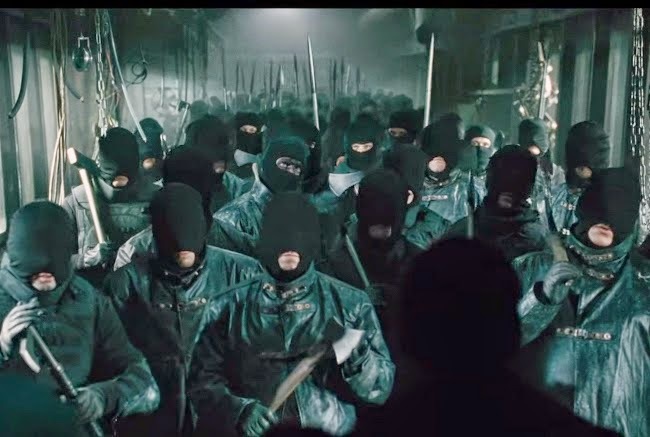 HelloTailor: To begin with, how did first you get involved with Snowpiercer? The combination of Korean and English-language production made me curious about how you came to work on the film. Catherine George: Director Bong had seen We Need To Talk About Kevin at Cannes in 2011, when he was on the jury, and he liked how the costumes looked. 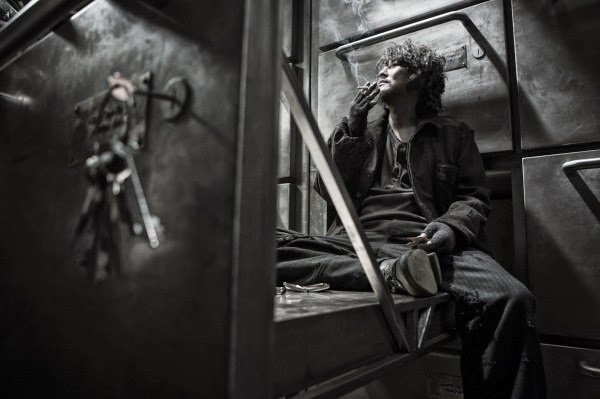 They sent me the script a couple of months later and I Skyped with Bong and and his producer Dooho because they were already in Prague prepping [for Snowpiercer]. Before I knew it, I was on a plane to Prague. Bong also met with Tilda Swinton at Cannes as they were both fans of each other’s work, and he decided to cast her as Mason -- a role that was originally written as a man. HelloTailor: How much did you consider the idea of finite resources onboard the train? In the Tail Section, people were wearing whatever rags they had left after 17 years. I was wondering what kind of thought went into the idea of a world where you can't really obtain new materials for new clothes. Was this a major concern when you were designing the overall look of each train car? CG: Yes, we talked a lot about how long the passengers had been on the train, where they’d come from, what random materials they would use to fashion practical clothing. In the Tail Section, the aging and distressing was quite heavy and their clothes were made of different parts of garments pieced together. They had to improvise with whatever materials they could find. Curtis' coat had layer upon layer of repairs. The character Painter wore a poncho made from old moving blankets. He also wore a helmet with a lantern left over from the train utility-wear, to enable him to draw in his cage at night. Chan, the kid who steals the matches and lights the flame, was the little thief of the Tail Section. We looked at pictures of child soldiers in Africa who attach small charms and amulets to their clothing to warn off evil spirits. Chan had all kind of stolen trinkets attached to his jacket. While designing Gilliam and his team of martyrs, I was inspired by an image of an Indian street beggar. The martyrs had missing limbs, and the sarong idea was more practical and combined Eastern and Western elements. In the prison section, Nam and Yona wear the darker-coloured intense black that we don’t see until we get there. Nam’s costume was inspired by train engineers from the early industrial period. We had discussed at length the global aspect to the mix of people on the train, and this was elemental in the making of the film. The cast was international as well as the crew, and we did a lot of research into bringing details from different cultures into the wardrobe. HT: Did you take inspiration from other dystopian and post-apocalyptic movies? Or alternatively, were there any particular aspects of the genre you were trying to avoid? CG: I loved Tarkovsky’s Stalker, how the colour changes and becomes more intense in the two different worlds. 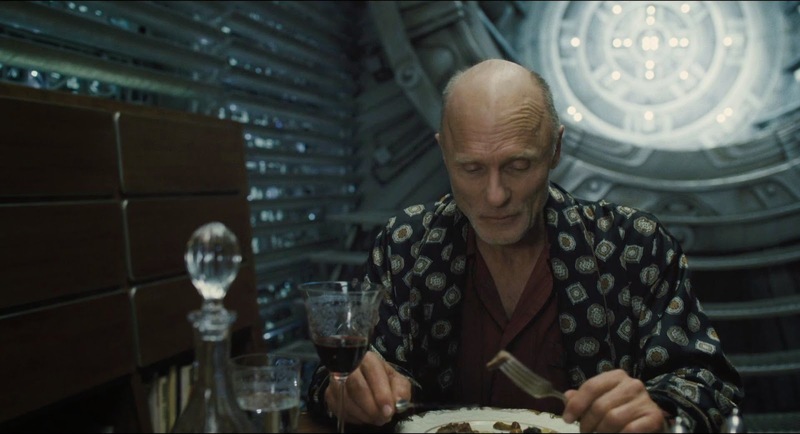 But mostly we talked about how we wanted Snowpiercer to start off at a point of realism and not go in a futuristic sci-fi direction. I love Children of Men and how realism is strong in that movie. I had designed different headgear for the axe soldiers. They were more like medieval-inspired helmets, but we decided to keep them simpler and in keeping with the theme of creating something from pre-existing materials or that could be improvised, so now the old ones look quite surreal. HT: When you were creating the look for each of the main characters, how much input did the actors have? I read an interview with Tilda Swinton where she mentioned you visiting her house to discuss what her character would look like, so I'd be really interested to hear more about that. Also, I was wondering if she was intentionally designed to look slightly like Ayn Rand, which is a comparison I've heard from a few people already. CG: I contacted all the actors and shared the research and design ideas for their character early on. 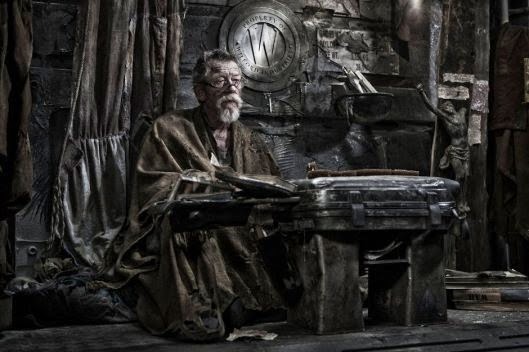 When we fit John Hurt in London we tried out an outfit and he shared a great story about aging his own costume for ‘Midnight Express’. Some of the other actors schedules didn’t allow for early fittings so we had to share images via email and we Skyped a lot. In Tilda’s case, Mason’s look was so drastically different that we needed to have clothes and prosthetics made in advance in order to camera test. So we travelled to Scotland with a couple of suitcases of clothes, wigs, glasses and teeth and really had fun with the wardrobe, all while Tilda’s fish pie was baking, and we also got to enjoy the Scottish countryside. I had collected pictures of dictators wearing elaborate uniforms and crazy hand-made medals. I hadn't looked at Ayn Rand specifically but I had collected some images of old ladies from that period who would wear their fur and look down their noses at people who were less better off, a bit like Thatcher. But now people are mentioning it, there are similarities to Ayn Rand . HT: Could you tell me a little about the process for designing the lead character, Curtis? I remember reading that Chris Evans had to wear sleeveless shirts under his coat in an attempt to make him look less muscular and healthy. That made me wonder how much of an active effort there was to visually distance Chris Evans the actor (who is now so recognizable as Captain America) from Curtis the character. CG: We talked and worked on Curtis' outfit for a while before Chris came to Prague. We wanted to make Curtis look very recognizable but at the same time anonymous, the common man who can't take the status quo any longer -- and yes, quite different from Captain America. We did have to fight against his physique and had to cut away the under-layers, his t-shirt, shirt and sweater. We had so many multiples made without sleeves for different scenes. Chris was available pretty early on to us. He wholeheartedly embraced his role and was in Prague rehearsing the stunt scenes, most of which he did himself. So luckily we were able to have more than one fitting and have more of his input, which was really helpful. HT: Each of the individual compartments is almost like a little world unto itself, with its very own colour palette. Was there an unusual amount of collaboration with production and set designers for this film, or is it just simply more noticeable thanks to this kind of strong visual cue? CG: I worked closely with Ondrej Nekvasil, our incredible production designer who himself was somewhat of a Wilford having built this amazing full-size train that was on a gimbal and moved and swayed. He had very beautiful detailed sketches and we talked a lot about the overall colour and tone of each car. HT: Are there any little custuming details that you feel particularly proud of, that you'd want people to look out for on their second viewing? CG: After all the dirt and destroying of clothes for the Tail Section, it was really fun working on the different themes in the front cars. I was especially happy designing the costumes for the lounge-car, the set was opulent like something from the Orient Express and I was inspired by one of my favorite periods in costume, the late Belle Epoque period. I was able to use very saturated colours and luxe fabrics, although unfortunately it is a very quick scene. The other little fun moment that you already spotted is Tilda’s cameo in the club scene. Previously: My thoughts on Snowpiercer. Fantastic interview, Gavia! I love the motivation behind Nam and Yona's all black costumes, as well as the kind of hilarious fact that Chris Evans is so super-humanly ripped that he cannot wear sleeves under that jacket if he is to look remotely like a normal person. If some one needs expert view on the topic of blogging then i propose him/her to pay a visit this web site, Keep up the fastidious work.